Home / Plans & Paperwork / Building Plans Approved! What’s Next? Our approval came by the means of a text message. The message informed us that our plans were approved and ready for collection. After all that waiting, a text message seemed like a bit of an anticlimax. By this time we were almost expecting a firework display and twenty-one gun salute to mark the official point where we could begin the building work. As soon as we were able, we collected the plans. Louis and Gwen were in the Malmesbury area one day during work hours so they visited the municipality between errands and collected the ever-important envelope. So, we can officially begin building. But that’s not the end of the paperwork. In order to submit the paperwork, we had to appoint a structural engineer to sign off the work once completed. The structural engineer takes responsibility for the structural integrity of the building. Understandably, this is a very important aspect of the project. The structural engineer we originally approached was happy to sign the documents so that we could hand in the paperwork, however, they did not want to commit to a quote until the plans had been approved. They told us that they often find themselves re-quoting several times when the various municipalities require changes to be made. In our case, the approval process, once submitted, was relatively simple. We had to go in once to answer a question regarding fire safety and sign a few more documents. One day later, we received the text message. The original structural engineers also required us to sign up the services of a Geotechnical Engineer. The Geotechnical Engineer is the one who approves the foundations (or in our case, container footings). He confirms that the specifications are in accordance with the type of soil on the building site, and the weight and design of the building. Since the time of handing in the paperwork, we have since made contact with someone who is both a structural engineer and a geotechnical engineer. Using him will help us kill two birds with one stone, and obviously save us a bit on costs. Kevin has worked with this gentleman and his company before, on a previous project, and likes the way they work. We’re very excited to be in contact again. We have received our quote from this company. He also told us that it is a simple procedure to notify the Swartland Municipality about our change of structural engineer. The company that we will be dealing with in regards to the roof also have their own structural engineers to sign off their work once completed. One (hopefully) last meeting scheduled for next week will help us ascertain whether or not all the various parties will be able to work together and who will be signing off what aspects of the project. We’re not expecting any problems, but it’s good to check. This will also give us an opportunity to ensure that everyone knows exactly what bits they’re responsible for so that there is no confusion later on. If all goes according to plan, we’ll be able to make our final decisions next week and give everyone the go-head. Once that is done we’ll be able to make our grand announcement as to the details of the structural engineers. We might even release some details on what will be an extremely awesome roof. Yay! Will there be fireworks with the grand roof announcement too? It really is! We can’t wait to get stuck in on the actual building work. Congrats! Now the work hard work begins! 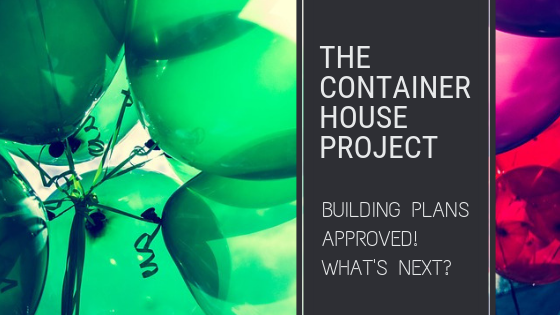 Congratulations on the approval of your plans! I’ll be watching this space like a hawk!